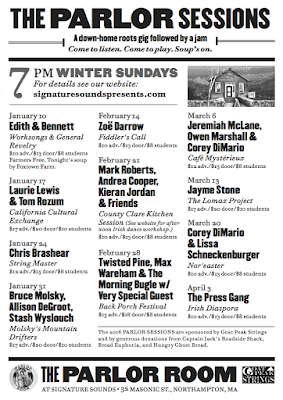 The Parlor Sessions are back! 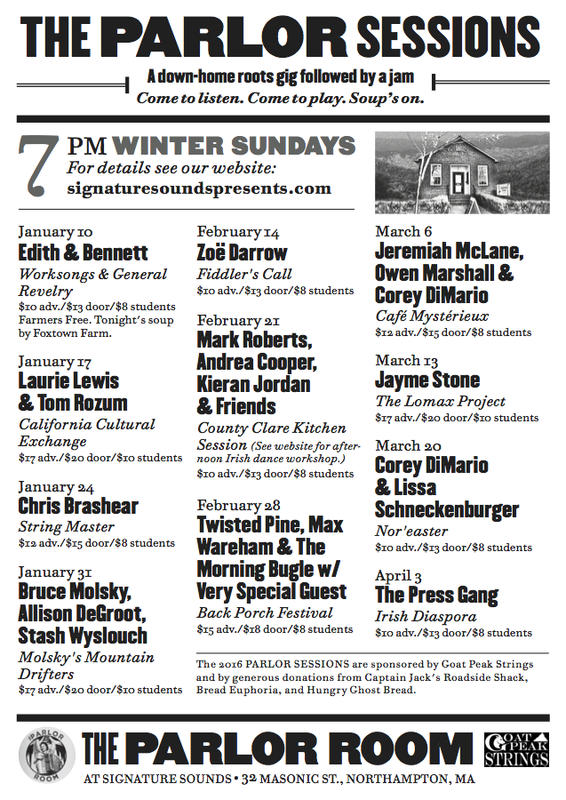 On winter Sundays from January 10th through April 3rd, we welcome American roots musicians to the Parlor Room for a concert, a break for hot soup, and an all-comers' jam. Tickets go on sale the week of December 14th at signaturesoundspresents.com. The Parlor Sessions are a take on the Newfoundlanders' kitchen party, the Irish pub seisiun, the NYC cellar jam. They're meant to welcome musicians, music students, and fans of American roots music -- a typical crowd at The Parlor Room on any night. The first half of the session is a down-home concert of the guest musician's work: old tunes, new tunes, works in progress, influences, interests. Then, a break for hot soup and bread. Then, the room changes over to a jam led by the guest musician. The house band helps get the jam going. Everyone who wants to can join or listen or sing, as suits. Bring your own stringed instrument and BYOB. This year's sponsor for the series is Goat Peak Strings (Easthampton, MA), which specializes in vintage, rare, and handmade stringed instruments.